I have begun the gradual process of gluing up the dresser case. Did side assemblies yesterday and several more stages today. I am doing this in small increments where possible to keep things relatively sane. First (today) the front web frame elements and apron (lower) were glued and clamped to case side assemblies. After a bit of time to set up, the web frame sides (runners) tenons were glued into front element mortises. Also did the top row vertical divider at this time. Was able to glue and clamp one piece at a time. Nice. Then came the rear web frame pieces. Their sliding dovetails were glued into sockets at rear of case. 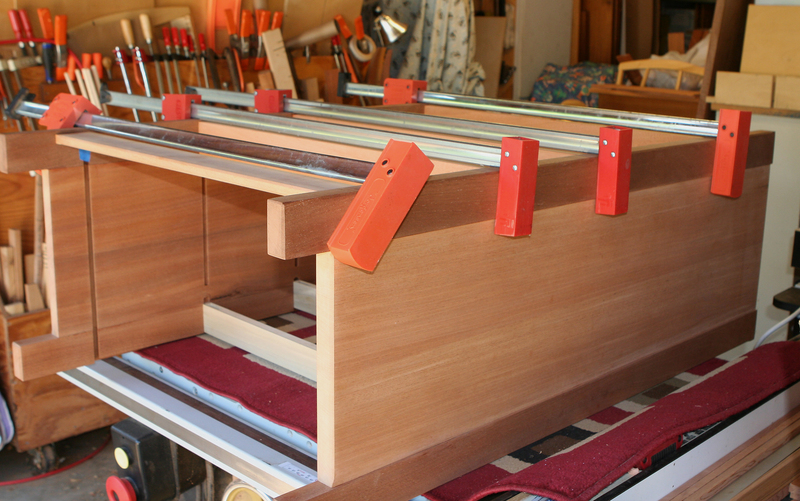 Side runner tenons fit into mortises, but are not glued and are positioned with a gap for wood movement. Initially, I pushed the rear pieces into the sockets flush with the rabbets cut in side assemblies. Opppps! Not appropriate. Have to go in further to fit into the upcoming grooves in the middle (rear) support. If my panic decision (glue is setting up) is appropriate, using the middle support groove gave me proper inset. See image below. I have been following along the construction process. Looking good!